The Carter Family has a legendary place in country music. Their songs, and the image of a family band playing wholesome music, have influenced countless of younger musicians who still play their repertoire. This story will explain how the powerful border radio stations of the 1930s and ‘40s, located in Mexico, first helped spread the family’s parlor-style country music to a mass audience. We’ll also hear from Janette Carter, who runs the Carter Fold in southwestern Virginia. Audio – An "X"-station ad recommends "Crazy Water Crystals" for anyone plagued by a "sluggish system." Audio – Worried about losing your job due to graying hair? Another "X"-station advertised product, called Kolorbak, may be the answer. Special thanks also go to Mark Zwonitzer, co-author of Will You Miss Me When I'm Gone? The Carter Family and Their Legacy in American Music, (Simon and Schuster, 2002.) along with Charles Hirshberg. The Border Radio Phenomenon. The "X" stations, situated south of the border in order to get around the Federal Radio Commission's regulations, were designed to send a signal all the way to Canada and beyond. For decades, beginning in the 1930s, stations such as XER, XERA, XERF, XEG and the rest attracted hordes of listeners, eager to hear musical performers and be swayed by pitchmen selling everything from Crazy Water Crystals to baby chicks, tomato plants to Last Supper tablecloths and autographed pictures of Jesus. Economics of Radio. Radio's advertising potential led to the development and success of the X stations. Pioneers of mega-watt border broadcasting––entrepreneurs like Dr. John Brinkley (the goat-gland doctor)––were well aware of the huge reach of a powerful radio signal and the income possibilities from dispensing wares and cures on the air. On the other hand, performers such as the Carter Family reaped enormous promotional rewards from their appearances on border radio. Radio and dissemination of musical style. Radio shows such as the Grand Ole Opry on WSM Nashville, the National Barn Dance on WLS Chicago, and the Wheeling Jamboree on WWVA Wheeling, West Virginia, popularized hillbilly and country music during the '30s, '40s and beyond. But it was use of the X stations that was the major factor in spreading awareness of these musical styles. The development of the X stations and the part radio––especially the "border-blaster" broadcasts––played in the history of country music. A largely rural listener base was significant in the economics of the border radio stations and an important factor in the decision to use hillbilly and country talent on the air. A look at the career of the Carter Family, one of the most influential groups in country music history. How did the border radio broadcasts of hillbilly and country music artists, the Carter Family in particular, influence other musical groups––both their contemporaries and musicians in the following decades? Janette Carter, daughter of A.P. and Sara Carter, and manager of the Carter Fold, a concert barn in Hiltons, Virginia. Janette and her cousins performed with the Original Carter Family on the border radio stations. Mike Seeger, musician, scholar, John Edwards Memorial Foundation Trustee. Charles K. Wolfe, professor of English and folklore at Middle Tennessee State University and a leading expert on the history and development of country music. Who could imagine that when Dr. John Romulus Brinkley's dubious Milford, Kansas, medical practice ran into trouble, it would lead to one of the most influential periods in the development of country music? The smooth-talking Brinkley made a name for himself in Milford in the early 1920s. His chief claim to fame was his "revitalization" surgery––transplanting goat testicles into older men, eager to reclaim their youthful vitality. Dr. Brinkley, who amassed a small fortune transplanting goat glands and peddling other questionable cures, obtained authorization from the Department of Commerce to build a radio station, and in September of 1923, KFKB ("Kansas First, Kansas Best") went on the air––"the Sunshine Station from the Heart of the Nation." KFKB became the perfect vehicle for Dr. Brinkley to expand his practice. His following grew as he dispensed medical advice on the airwaves. "But, oh my friends," he would tell his listeners, "you must help me. Remember your letters asking advice must be accompanied by two dollars ..."
By the late '20s, John Brinkley had attained enormous wealth; he'd also accumulated his share of detractors. The AMA labeled him dangerous, and in the spring of 1930, the Kansas City Star began a series of articles aimed at exposing Brinkley as a fraud. Ultimately, the doctor was hauled into court and stripped of his medical license. Brinkley countered by running for governor as a write-in. But probably due to the vague election rules regulating write-ins­­––almost 200,000 ballots were tossed out for write-in irregularities––the doctor lost the election. The next year, 1931, after the Federal Radio Commission refused to renew his broadcasting license, Dr. Brinkley announced plans to build a radio station in Mexico––XER, in Ciudad Acuña, Mexico––just across the border from Del Rio, Texas. The 500,000-watt station was free from the encumbering regulations of the FRC. And while the Mexican government shut XER down in 1934 for broadcasting in English only, it reappeared as XERA in 1935 with a signal that rose to a reported 1,000,000 watts––"the world's most powerful broadcasting station." Many hillbilly and country acts were hired by XERA and other border radio stations. 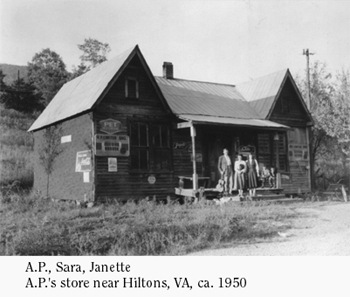 Perhaps the most significant was The Carter Family, A.P., Sara and Maybelle, as well as A.P. and Sara's daughter, Janette, and Maybelle's children, Helen, June and Anita. 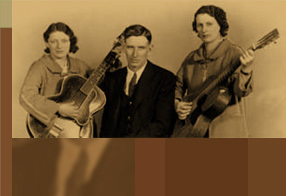 For approximately three years, beginning in 1938, the Carter Family could be heard––both live, and later via radio transcriptions––on XERA and various sister stations across the border. They were sponsored by the Consolidated Royal Chemical Corporation, which sold Peruna ("...to knock out the torture of colds ... ") and Kolorbak ("... scientifically imparts color and charm to gray hair ..."). The Carters became known nationwide and enjoyed increased record sales as a result of their border radio years. According to Charles K. Wolfe, "This gave them the largest radio audience they ever had, and soon even the old Bluebird [label] records were selling like wildfire." And in the decades that followed, many country artists credited the Carter Family as their inspiration. The story goes that Waylon Jennings, growing up in Littlefield, Texas, remembered back to being about four years old when his father used to pull the truck up beside the house and run a cable from the battery to the radio so he could listen to the Carter Family on XERA. Johnny Cash, too, remembered hearing the Carter Family (including 10-year-old June, whom he would marry some three decades later) on the border radio broadcasts. The border stations, wrote Bill C. Malone, "popularized hillbilly music throughout the United States and laid the basis for country music's great popularity in the late '40s and early '50s." The Carter Family on Border Radio. JEMF 101. (LP) Radio transcriptions. The Carter Family on Border Radio from Radio Station XET Monterrey N.L. Mexico 1939, 3 vols. (Arhoolie Records/Arhoolie Productions, 1995.) A collection of transcriptions the Carter Family, including the Carter children, made in San Antonio, Texas, in 1939 for broadcast on radio station XET, Monterrey, Mexico. Includes liner notes by Ed Kahn. Gospel Songs by the Carter Family in Texas. Old Homestead. OHCS 116. (LP) Radio transcriptions. The Carter Family: In The Shadow of Clinch Mountain. Bear Family Records Bcd15865lk Twelve-CD set, includes book by Charles Wolfe. 12th CD includes a previously unissued 40-minute 1963 interview with Sara and Maybelle Carter by Mike Seeger and Ed Kahn, four previously unissued duets by Sara and Maybelle recorded by Seeger and Kahn at Sara’s home in Angel’s Camp, CA., and an LP interview with Maybelle Carter, which was circulated to DJs in 1973 but not otherwise made available. In it she talks about everything from autoharps and fingerpicking to tales of her first Grand Ole Opry appearance and the early days of radio. Kahn, Ed. 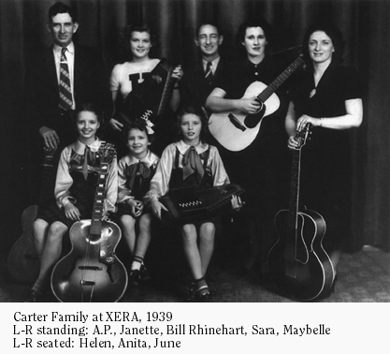 "The Carter Family on Border Radio," in American Music: A Quarterly Journal Devoted to all Aspects of American Music and Music in America, vol. 14, no.2 (summer 1996): pp. 205-217.